La grotte : Diving conditions : sheltered from the North wind thanks to the Bec de l’aigle cliff and from a light East wind thanks to the Green Island. Very often strong surface current. Be careful to your buoyancy control and do not touch anything ! Dive for all levels. 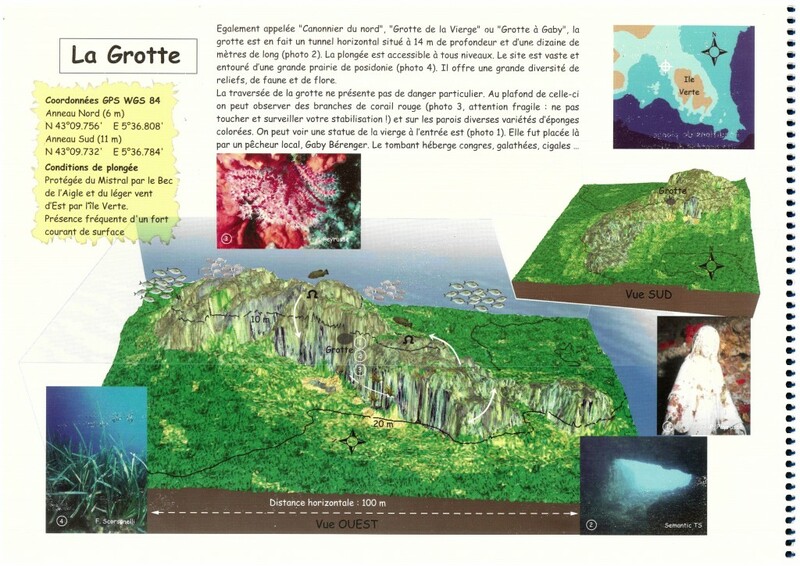 Also known as « canonnier du nord » , « grotte de la vierge » or « grotte à Gaby » , the cave is in fact a 10-meters-long horizontal tunnel at a 14 meters depth (photo 2).The site is large and surrounded by a great field of posidonia (photo 4).It offers a large variety of marine fauna and flora reliefs.